The motion of theoretical mechanism that, without any losses due to friction or other forms of dissipation of energy,would continue to operate indefinitely at the same rate without any external energy being applied. 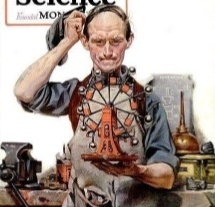 I think at one time or another as kids we tried to figure our how to make a perpetual motion machine. We never gave much thought to the fact that man has tried forever to accomplish this feat without any success. But such is the mind of a young boy in a small town in the midst of summer vacation… hope springs eternal. And as proof of that I want you all to be the first to hear that after 74 years I have discovered the secret of perpetual motion and I observe it continuing to run day after day. OK, maybe I stretched the truth a bit and I should call it by another… Continuous Conversion. I used to think about salvation as a one time event, a one moment decision in response to the gospel message and the wooing of the Holy Spirit. But as time has gone by I have learned that while salvation itself is a free gift from God, the process of being converted is a life long journey that continues every day toward the goal of fully turning into the mature children of God. And that is why Romans 8:29 has become a life verse for Walk With God Ministries. The truth of the matter is that there really is perpetual power involved in the process of being conformed into the image of Jesus Christ. The problem, however, is that we too often slow things down by injecting ourselves and our “natural ideas” into the process, producing consequences that sidetrack our continual transformation. Think of it this way. The changing (transformation/conformation) of our natural life into the spiritual life is fueled by the Word and the Holy Spirit; Continual Conversion. The power behind the process is initiated at the moment of our salvation and is never-changing and never-ceasing, it is perpetual and eternal. It is only slowed by our failure to respond to the process of putting on the new man (Matt 18:3). Or put another way: moving from being “IN” Christ to being “OF” Christ, which is moving from ruling ourselves to submitting to God’s rule in our life. And that entails eliminating the pride and self-centeredness that inject the “I Won’t” into God’s process, which begins to slow everything down. The bottom line is that God is the power behind our process of Continual Conversion, and what in our eyes is our strength is weakness in God’s eyes. He is our strength and in subjecting ourselves to that strength and allowing the Holy Spirit to use as He wills in our life is what fuels a perpetual process that goes on into eternity… continuing to operate indefinitely at the same rate without any external energy being applied.